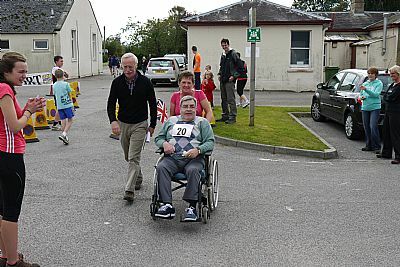 The 2012 Puffin Pool 5k run/walk/disabled event took place on 23rd Sep 2012, on a beautiful hielan day. Walkers and disabled to follow. There are probably 20,000 disabled adults and children in the Highlands and Islands. Most of these suffer from arthritis, backache or illnesses like stroke, multiple sclerosis and cerebral palsy. Hydrotherapy is a kind of physiotherapy and specialist treatments to ease pain and increase mobility in people suffering from these illnesses. The warm pool can be used by anyone with a disability whether mentally, physically or sensory to exercise and improve their quality of life. Hydrotherapy also helps to speed recovery from injury at work and sport and offers a great way of exercising and promoting good health. The buoyancy of the water coupled with the extra heat relaxes the body’s muscles and ligaments, which allow you to carry out pain relieving exercises and improve your fitness. The intensity of the exercise needs to be adjusted according to your age and fitness. You can start using the pool this week by contacting the puffin pool for details.